Ah, summertime. The time of year where the kids run barefoot, I rock flip flops ’til October, and the garden hose becomes an instant water attraction. Sad to say, but there are times in which our kiddos need to wear some actual shoes on their dirty feet. That is if you can get your toddler to sit in one place long enough to squeeze their chubby little feet in. That’s why I’ve come to love our son’s Native Jefferson shoes. Truth be told, I’d seen them on several kids before but never knew what they were until my wife brought them home one day. A hybrid shoe and sandal that helps keep their feet protected yet still provides airflow has been the perfect addition to his summer wardrobe. Cleaning – Any parent knows cleaning can take over your life. So here’s some good news, throw these bad boys into the dishwasher, under the garden hose, or even the kitchen sink. Done. A quick wash has them looking clean and fresh in moments. With the record setting heat we’ve been getting in the Northwest this summer, I’ve been putting them outside for a quick dry and they’re ready to go in no time. Apparently they’re made with odor resistant material, which if you’ve ever smelled a toddler can come in extremely handy. The white trim will gently fade into a yellowish tinge but that’s okay. It shows they’ve been used and loved by a rambunctious toddler. Ease – These slip on with very little work. 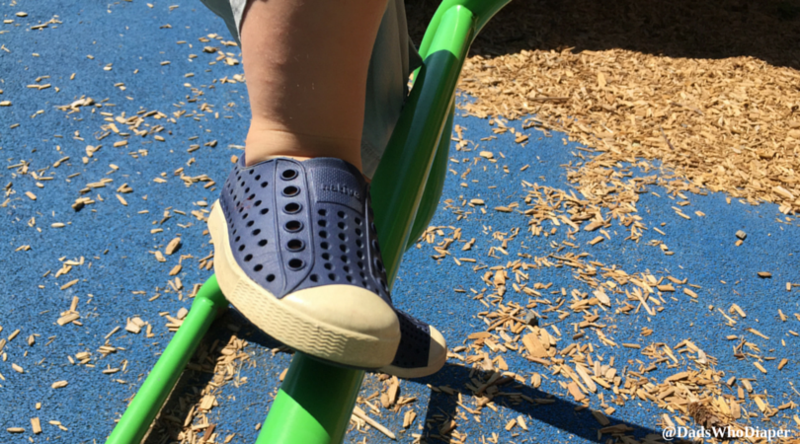 The aforementioned difficulty to get a toddler to sit still can make applying the proper clothing and footwear feel a bit more like a wrestling match than a simple daily activity. But these suckers seem to slide on with relative ease. The one exception would be a sweaty or wet foot seems to grab the shoe a bit requiring a bit more muster to get them on. But that’s a simple problem to fix. Style – I’m by no means a style icon. I buy clothing at Costco, much to my wife’s chagrin. But I do know that these shoes go well with nearly every outfit he rocks on a daily basis. Simple and colorful, they work at the museum or the pool, it doesn’t matter or get any easier. Travel – We’ve already done some extensive traveling this summer, with more trips planned to the beach and the high desert. If he’s not wearing them while we’re enroute, then our Natives can almost literally be thrown in anywhere and be perfect when we pull them out. They’re flexible, durable, and (so far) nearly indestructible. I love that I can toss them in, zip the suitcase up, and pull them out in perfect shape as when I put them in. So let’s talk about price. Retailing north of $30, they’re certainly not cheap. And as someone who is, say, frugal, I find that pill hard to swallow for a pair of kids shoes. My first thought is always, “how fast will they outgrow these?” Let’s just say I’m glad my wife bought them while I wasn’t around. That said, buying at full price you’re definitely getting what you pay for. Quality. Our son has worn his almost daily and through every kind of wear and tear you can think of since we bought them over three months ago and we’ve seen absolutely no signs of problems. Better yet, if you can get them on sale, then STOCK UP! From our experience, they are worth the price.